Excerpt #3 – Papa, Where Are You? Be sure to read more reviews on my author website by clicking below. Apparently one can go back home again – for a visit. That’s what Hubby and I did last spring. We toured my roots, mostly Pennsylvania, with a bit of New Jersey thrown in. 50+ years ago I attended Camp Cherith, nestled in the Pocono Mountains of Pennsylvania. At that time it was an all-girls camp connected with Pioneer Girls. Honestly, I never liked Pioneer Girls but I loved Camp Cherith. I learned about camping and swimming and horseback riding. One summer I worked as a Kitchen Aide in order to stay longer with less expense. I worked with the horses and I learned all sorts of crafts. Most of the counselors came from PCB – Philadelphia College of the Bible. During the school year, once in a while a friend and I would take the train downtown to visit them. Although it’s now a co-ed camp under a different name, we were fortunate enough to connect with the director who had a person give us the full tour. Most was unfamiliar to me except the dining hall, the cabins, the lake and the rock walls. Fond memories! We visited New Hope, PA and directly across the Delaware River, Lambertville, NJ. Growing up, on the way to visit my New Jersey relatives, we would drive right through these quaint towns but now the new highways bypass it. I always wanted to stop and shop but my dad was the type to “do not stop until we reach our destination.” This was my opportunity!  We bypassed the bypass and found the towns. These two towns are wonderful places to visit, with much history attached. It’s a shame about the new highways as folks are bypassing history. As we drove down from there toward the rest of my youth recollections, I couldn’t help but notice the rural area all around. I used to say I was from the “suburbs” of Philadelphia, but now I see it was even further out than that. We lived in “the sticks”, a lot of farm country! I recall that no public transportation came out as far as our home and my school bus ride was basically at the end of the line! We saw the two houses I lived in, growing up. We drove past the hospital where I was born and 43 years later my dad would die in. We checked out my grandparent’s row home in Philadelphia. And the alley in the back where my brothers would play kick ball and I would roller skate. Such vivid memories come to mind of my sweet grandparents. We went to a familiar diner across from the now-closed Willow Grove Navy Base. We visited friends of my parents – way into their 90’s, who caught us up on all the people I knew all my life from my church. I would have lots to share with my mother later. We visited the cemetery where my grandparents, my grandfather’s brothers and their wives, my dad, my brother, my Great-Great Uncle Harry and many, many other relatives are buried; the place where my dad’s brother, who died in 1918 at the age of two from meningitis, was buried. So much history, rich family history! It’s funny that I still call it home when I’ve lived away from there longer than I lived there. But I suppose “home” means “roots”. And they go deep. I’m so glad I went “home” for a visit! The house pictured here is part of my heritage and plays a prominent role in my book. If you’d like to purchase ‘Papa, Where Are You?’, click on the link, next to the “About” button above. And be sure to read the reviews! Researching for my book (which may or may not be published someday) has become my favorite part. Delving into old records via Google and the variety of internet sources, not to mention old, old family letters and photos, has been like a giant puzzle. Super sleuth that I am, I love puzzles! 🙂 And I hoped I had found that final allusive piece – my grandfather’s burial site, his final resting place. For reasons somewhat confusing and mostly sad, to say the least, my grandfather was separated from my family in the 1920’s. A year or so ago, I believed I had found him. It was a simple death certificate written in the coroner’s hand with detailed facts. The one difference was, for some reason known only to him, my grandfather dropped his first name. The death certificate stated his name – using his middle name in place of his first given one, date of birth, place of birth and parent’s names. All were right-on accurate. It was a complete surprise as we knew his last location before the trail went cold, was Chicago; prior to that Pennsylvania and New Jersey. How he ended up in Indiana we’ll never know. But how excited I was! I told hubby the next time we are in Indiana, we need to track him down. I had the name of the cemetery, located in Ft. Wayne. Last month we had our opportunity. 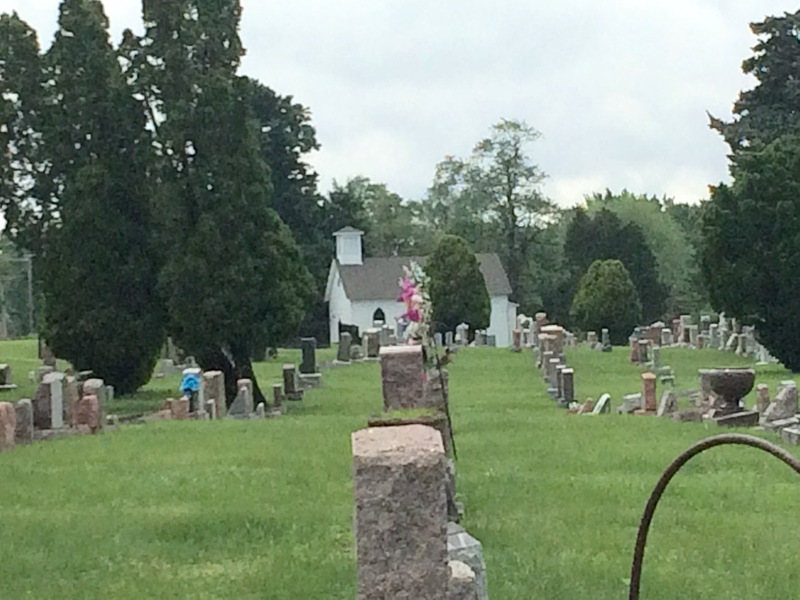 After visiting friends an hour or so north of there, we headed south to Prairie Grove Cemetery. I’m thankful for GPS! Finally, after driving around little back roads, there it was. Or at least I was hoping this was it. There was no sign, no office, no official entrance. But according to GPS, this was the place. 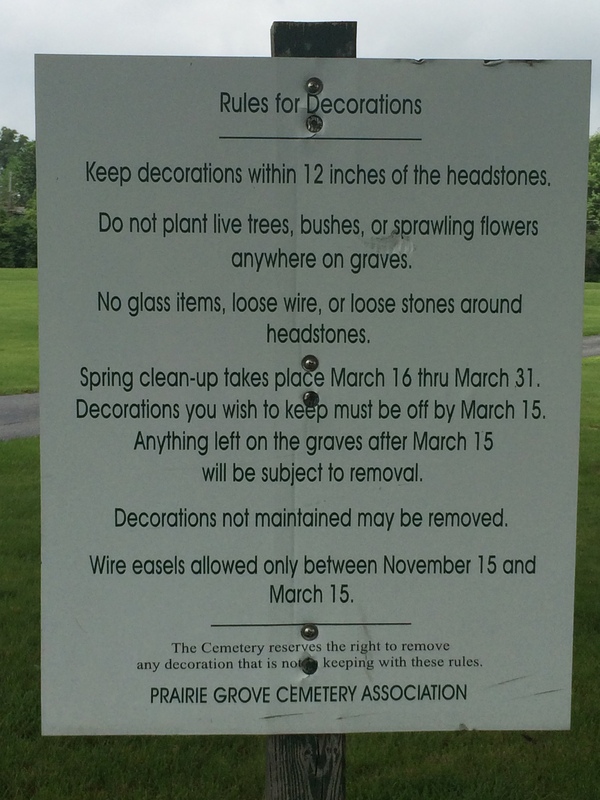 We turned on one of the roads and finally found a sign posted which actually said “Prairie Grove Cemetery Association” so I was excited to know we were in the right place. There is a small old chapel on the grounds – built in 1850 – that has seen better days. It appeared to be locked and my research indicated that it had undergone major damage from a fire deliberately set in 2008. Apparently restoration was underway. The earliest recorded burial in the cemetery was 1834. 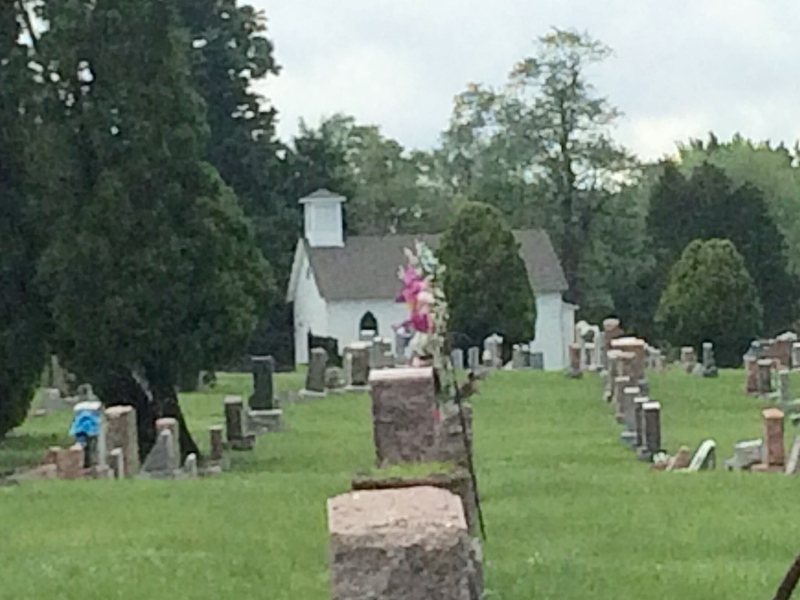 Okay, so here I was, surrounded by a sea of headstones and a small chapel. Now what? How was I supposed to track down the actual location of my grandfather’s final resting place? Online, some of the named locations were listed as someone actually went through major parts of the cemetery and cataloged all they could find. But my grandfather was not listed. I assumed maybe no one had provided a headstone for him or maybe his part of the land was not yet recorded. But I knew somewhere – as in all cemeteries – were official records. I had hoped there would be a little office on the property, but alas, no. Not even a caretaker was present. We drove back to that original sign posted by the Prairie Grove Historical Association and found a phone number. The lady on the other end of the line was very gracious and most helpful – to a point. Her first question: “What year did he die?” 1931. There was a long pause on the other end. Finally the kind lady informed me that there had been a fire in the records office in 1936 and all prior records were destroyed. My heart sunk. I questioned if maybe there was a certain spot where ones of that age were laid to rest? No. Apparently anyone could choose any place. I concluded that was true as I walked a bit around looking at old and new graves next to each other. There was no way I’d be able to find my grandfather’s grave. I was sad; I was deeply disappointed. But then I thought about it and I felt a tad closer to my grandfather – someone who I obviously never met, and that made me smile. I’m encouraged that when I get to heaven and hopefully meet him there, he’ll tell me the rest of the story! With some peace and the knowledge that I had tracked him this far, we drove away.